Here's a blog by Barbara Fisher at Tigers & Strawberries (offsite, opens in new window). 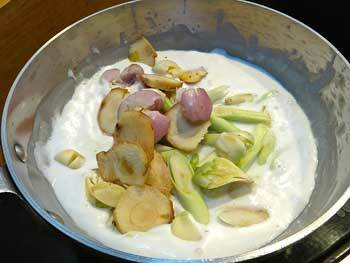 Pour the coconut milk into a large saucepan. Peel the turmeric and smash well with the flat blade of a cleaver or heavy knife to bruise and add to the pot. Trim off the woody bottom tip and top third of the lemon grass stalks. Pull out and discard the loose outer leaves. Cut the trimmed stalks into two segments, and likewise, smash to bruise. Peel the shallots, leaving the red shallots whole; if using the larger brown shallots, cut each in half. Bruise also. Slice the galanga into very thin pieces. Add lemon grass, shallots and galanga to the pot, along with the salt and sugar. Heat over medium heat and slowly bring to a boil, stirring occasionally. Add the fish head and cook for 5 minutes to flavor the broth. Then follow with the remaining fish pieces. Return to a boil and add fish sauce. Cook over low to medium heat uncovered, enough so that the sauce simmers slowly. Turn the catfish pieces gently from time to time for even cooking until the pieces are cooked through – about 10 to 15 minutes. Serve warm with rice and other dishes in a shared family-style meal. Serves 6. In the southern region of Thailand, plentiful coconut milk and fresh turmeric are frequently combined to cook various kinds of fish and vegetables. Neither a spicy curry nor a soup, this rich, savory dish has subtle flavors and is a good accompaniment to highly spiced dishes in a meal, helping douse the fire burning in the mouth and on the lips. The flavor of the coconut milk is important in this dish, so use a good-quality brand, or make your own from fresh coconut. Fresh turmeric, too, is essential, but if you must substitute, use 3 tsp. of the powdered kind and add an extra 1/2 tsp. of sugar to the recipe; the sauce, however, will not be nearly as good. When tasting the sauce during cooking, make sure it is saltier than "to taste" (see Cooking to Taste) so that it will not be bland when served over plain, unflavored steamed rice. After all, the Thai name for this dish literally means "salty, boiled catfish in coconut milk" (dtom = boil, kem = salty, gkati = coconut milk). Like curries, this dish tastes even better when made a day ahead of time. The flavors of the herbs are more pronounced and better blended and the catfish tastes less fishy. Catfish when cooked with the bone in and skin on will stay firm and does not easily fall apart when rewarmed the next day for serving. The head, tail, bones and skin add depth of flavor to the sauce, as well as thicken it. Whole catfish already cut into chunks are sometimes available from Southeast Asian markets, saving you from the challenging experience of having to chop the fish through the bone. If fresh catfish with skin still attached is not available where you live, substitute with the skinned "pan-ready" catfish. Though the head and tail have been trimmed off, it substitutes better than fillets since some bones remain to flavor the broth. Or use other fish cut through the bone into steaks. Although Kasma does not teach this recipe, she teaches a somewhat similar one – Basa (Swai) Steaks Cooked in Herb-Infused Coconut Milk (Bplah Swai Dtom Gkati) in the Evening Advanced Set I-3. *Because the Thai language has its own script, there are different ways of transliterating Thai into English. The more phonetic version is Dtom Kem Gkati Bplah Doog; the more usual spelling is Tom Kem Kati Pla Doog. See A Note on Thai Pronunciation and Spelling.